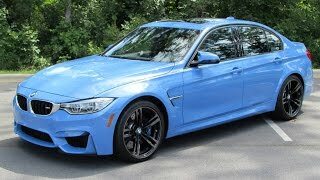 BMW has revealed the new 2015 M3 Sedan and 2015 M4 Coupe, with both vehicles losing some pounds, offering more power and promising a continued focus on motorsports. Low-slung and broad-set, the new BMW M3 Sedan and new BMW M4 Coupe share a finely balanced stance on the road. Large air intakes and Air Curtains at the front end, exposed carbon-fibre reinforced plastic (CFRP) and aluminium body components, and the diffuser at the muscular rear end fulfill functional roles in terms of aerodynamics, cooling and weight saving. The interior architecture comes complete with unimpeachable ergonomics and clear driver focus. Traditional BMW M equipment details includes M door sill finishers, an M driver's footrest, M gearshift lever, M-design circular instruments with white graphics, M leather steering wheel with chrome trim, colour contrast stitching and electroplatedlook shift paddles (if the M DCT gearbox is specified). The M3 and M4 will be powered by 3.0-liter TwinPower Turbo six-cylinder engine that develops 431 HP (317 kW) and 550 Nm (406 lb-ft) of torque. 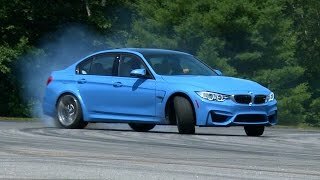 Two transmissions will be available in the 2015 BMW M4 and 2015 BMW M3: a six-speed manual capable of rev-matched downshifts, and a seven-speed twin-clutch automatic. 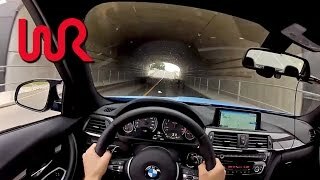 The standard sprint from zero to 100 km/h (62 mph) takes the new BMW M3 Sedan and new BMW M4 Coupe 4.1 seconds respectively. Top speed is 250 km/h / 155 mph (electronically limited), or 280 km/h / 174 mph if the optional M Driver's Package is specified. In terms of fuel efficiency, owners can expect to average 8.3 L/100 km (28.3 mpg US / 34 mpg UK) with CO2 emissions of 194 g/km. 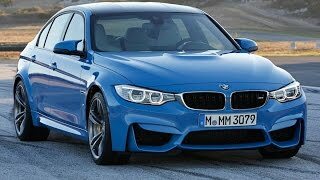 The 2015 BMW M3 and 2015 BMW M4 will be officially revealed in January at the 2014 North American International Auto Show, and will go on sale in the summer of 2014. Pricing will be announced closer to launch.